Around this time of year we begin to see the results of “Beacon Beauty Pageants” as someone launches tests of the various avalanche transceivers on the market. The tests are normally pretty straightforward. Hide a beacon under snow and then time how long it takes people to find it. So far, so simple. The SLF (Swiss Avalanche Research Institute) and ANENA (French National Association of the Study of Snow and Avalanches) decided to get a bit more in depth. 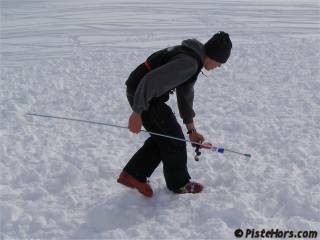 Last spring they carried out a series of tests using different groups of users and the results were published at the International Snow Science Workshop this autumn. The SLF/ANENA tests put a particular emphasis on multi-victim searches. Although rare they cause particular problems for rescuers even with modern digital avalanche transceivers. 18% of incidents reported to the SLF where a victim was completed buried were multivictim (2 or more) scenarios. The tests were split into two sections: beginners/intermediate, who probably represent the majority of users, and advanced (club instructors, guides, pisteurs, rescue workers). The different types of user were given transceivers adapted to their level. All the transceivers were three antenna designs with digital output. The Arva Axis, Link and Mammut Pulse also have a raw analog function by-passing the beacon’s own signal processing. The beginner group tested 5 mid-level transceivers: Arva Axis, Mammut Element, Ortovox 3+, Pieps DSP Tour, Tracker 2. The advanced users tested the: Arva Link, Mammut Pulse, Ortovox S1+, Pieps DSP. For the beginner test the park used transmitters with a short, 100ms pulse with a random pause between 950 - 1050 ms to limit problems with signals masking each other. Transmit frequencies were very close to the 457kHz standard. All the transmitters were buried with optimal antenna orientation for maximum signal strength. The test area was 50 m.sq. On average an avalanche deposit measures 80x100m where a victim is completely buried so this is a fairly small search area with almost no primary search phase required. This favoured transceivers with limited search range, like the BCA Tracker II, for the time to first victim. For the advanced test the transmitters were buried at least one meter underground protected by a 50x70cm plank with some buried at 2 to 2.3 meters. The beacons were located in four separate search areas of 100m.sq. Two areas has a basic multi-victim scenario with 3 victims with a similar configuration to the beginner tests. In one test area the carrier signal of one transmitter was -50Hz, still within the +/- 80Hz tolerance allowed by the ETS 300718 standard. Another transmitter was -100Hz, outside the current standard but just within the tolerance allowed by the old standard (ie an Old Ortovox F1 still widely used by club groups). This reflects the reality where transceivers’ carriers often drift below 457kHz. In the other area a beacon was +30 Hz. The two other areas had complex multi-victim problems to solve with four active beacons, two in close proximity with a long pulse leading to frequent masking of the signals. The aim was to see if searchers could detect the problem and switch to an alternative search strategy (microstrips, 3 circles etc). All the searchers received training from representatives of each transceiver company. This focussed on a basic introduction to each transceiver for the beginners to and in depth look at mult-victim strategies for advanced users. The beginners were all able to find the first beacon within 2 minutes. Problems began with the second beacon, in 5 out of 40 cases the second beacon was not found in the required time and things got worse when searching for the 3rd target where four of the five transceiver had trouble finding the victim. The tests showed that there were considerable differences between the various transceivers in multi-victim scenarios. The fastest transceiver to the first target was the BCA Tracker 2, confirming BCA’s marketing that for beginners, at least, simple is better. Overall, and including 2nd and 3rd victims the Mammut Element came out best with fast search times and only 1 victim missed on the 3rd target. The Pieps DSP Tour and Arva Axis had problems with the marking function which caused particular difficulties with 3 victim searches. The Tracker 2 out perfomed the Pieps and Arva and even came in just ahead of the Ortovox 3+. The advanced users were all able to find the first beacon in the required time with the Mammut Pulse being the strongest performer. Only the most complex tests posed real problems for the searchers and then only when looking for the 3rd and 4th victim. Advanced users were able to find the beacons even where the marking function failed to work properly. They had most problems using the marking function of the DSP Pieps but the differences between the transceiver types were marginal. Professional rescue workers were, on average, 20% faster than guides or club instructors. It is clear that Beginner and Intermediate users are much more dependent on the ease of use and tolerance of their transceiver. Their lack of experience, training level and the limitations of the transceiver made applying alternative search strategies difficult once they reached the limit of their device. There is a clear difference in the speed of professional rescue workers and other users. If you are worried about multi-victim searches but are on a limited budget then the Mammut Element is a good investment. It would suit professionals taking exams where setting up complex searches with faulty beacons is beyond the scope of the organizers. Recreational users would also be well served by the BCA Tracker II. It is not as strong performer where 3 or more victims are buried in proximity but is extremely rapid to find a single victim and reasonable on 2 victim searches. For Pros, who have the training to exploit the advanced features, the Mammut Pulse is a very strong performer. I have both Tracker2 and 3+ available and I find it hard to believe T2 outperformed 3+ in a (beginner) multi victim scenario purely because it does not have masking. No beginner can possibly resolve that situation with a T2 without instructions. Prior to purchasing my 3+ I did my own testing during an avalanche seminar where many different models were available. I tried them all (but no ARVAs or BCAs) on a 3 victim scenario and the 3+ was by far the easiest to use without any explanations. I went out without knowing anything about the beacons I was using, trying to see which one was easiestto use out of the box, no instructions, nothing. With every other beacon I had a few “WTF? !” moments where I had to stop and figure out what it was trying to tell me. I was especially pissed of by Mammut beacons which, in my mind, are to be widely avoided unless you enjoy interacting with the beacon rather than focusing on the search. They might be fine, even excellent as the test shows, after reading/receiving instructions, but horrible for a true beginner. I had wondered if there was some nationality bias, these being Franco-Swiss tests and the Mammuts coming out on top. But then the French Arvas score badly. I know what you mean about the Mammut Pulse with its “standstill”, “457KHz Fail” and other messages. Here are the results for the Beginner group. The final line is interesting, it shows the cases where the 1st, 2nd and 3rd beacon was not found within the time limit. You see the Tracker 2 users failed to find 2 of the first targets - obviously the multi-victim scenarios caused problems as you suspected for this beacon. The article is not 100% clear but I think they set an overall time limit of 10 minutes. So you could interpret that as of concern for the Tracker 2. The Ortovox is competitive with the Element but the users in this test had trouble with the 3rd beacon location, failing in 12 cases. Could you possibly provide a direct link? I did a quick search on SLF and couldn’t find anything. I have two slight problems with the beginner test purely because they received beacon specific training prior to searching and all participants rotated around the test fields with different devices. If you’re really after testing the UX aspect of beacons then any familiarity produces biased results. Good UX interface is not about consciously compensating for design flaws. Moreover, subjects are bound to improve their results between first and last test no matter what device they use. They might have cancelled out differences between beacons but probably reduced overall median times. Ultimately it was a very decently designed test that compensated for many things that could skew results but not all and it did not show the obvious interface flaws present in some of these devices. The article in question is published in “The Avalanche Review” and would be pretty hard to scan/copy as its quite big. I like simple beacons is my take is that like shovels, its the simple things that make the difference especially when digging out folk 3 or 4 at a time when you have a HR thats through the roof and the shits in the fan. The T2 user needs training for multiple burials. The Ortovox 3+ is a nice compromise and I like it but its not quite as reliable as it could be yet, and I think the glitches in the N. Amercan models are a bit more universal.